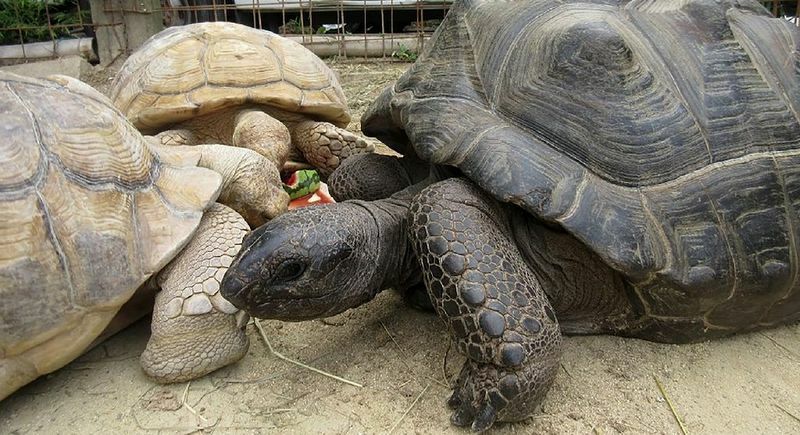 JAPAN: A giant tortoise that made a break from a Japanese zoo has been found safe and sound two weeks after it escaped, only 140 metres away from the park. The 35-year-old female, named Abuh and measuring around one metre in length, steamed out of the Shibukawa Animal Park in Okayama prefecture in early August having been allowed to walk freely around the zoo during opening hours. Zookeepers, unable to trace the truant tortoise, offered a reward of 500,000 yen, or about B152,000 for her safe return. Their plan proved a success when a sharp-eyed local bounty hunter spotted the roaming reptile in nearby shrubbery. "We were so relieved that she came back safely as she is so popular among children," said zoo staff Yoshimi Yamane, describing Abuh, who weighs 55 kilogrammes, as having a "gentle" disposition. "We will try to take new measures so that this won't happen again," Yamane added, without giving details. The incident was the second time in less than a month that Abuh had disappeared. Her return home to the zoo was a top item on a TV news bulletin by Japan's public broadcaster NHK.